Minecraft seems to me one of those concepts that shrinks back into its subterranean lair whenever I feel I’m about to wrap my head around it. Apparently, though, I’m in the minority. This is proven on an annual basis by the seismic super-conference know as MineCon. And 2015, dear friends, was a real doozy. Having written a book on Minecraft, Simon departed for London secure in the understanding that, along with his co-author (and son, adhering to the adage) Matthew, he was something of an authority on the matter. 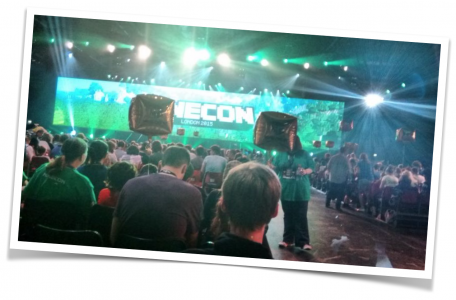 Yet even for two Minecraft experts, the sheer scale of the conference was something of a shock. Over 10,000 people attended in total, a blocky mass of colourful characters reminiscent of the digital platform they had gathered in celebration of, each of them with their own Minecraft chronicles and creations to share. A number of announcements were met with the approbation of gamers and programmers alike over the two days that the conference was held. Talks of Minecraft coming to Windows 10 and getting a story mode set the tone, while new features such as improved loot and upgraded locations kept the crowd pleased throughout. The fact that Minecraft is branching out into education is a testament to how quickly young people are able to learn when they are granted the permission to be creative with their projects. 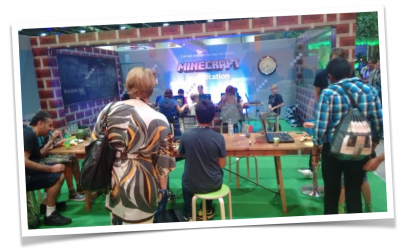 A few stalls at MineCon were established to display the different ways in which Minecraft is being used in schools to aid in teaching a variety of subjects, from Physics to Architecture by improving teamwork and problem-solving skills. All in all, MineCon 2015 was a roaring success. For some, Minecraft is still the video game that they fell in love with, the pixellated survival simulator that contribute to the ranks of YouTube’s best ‘Let’s Play’s, but to others, it has become something far more important. As it continues to evolve – and as programmers continue to evolve with it – it is able to excel in being the “safe place” for amateur programmers to experiment, to get a taste for what can be achieved with a little bit of technical ability and a lot of creativity. And that’s really promising.